Yellow Walking Iris… what a fascinating common name! A name well-suited to describe its wandering ways. It has the tendency to throw out aerial plantlets along its inflorescence stalk from spent flowers. Then, the weight of the growing plantlets would bend down the stalk towards the ground, causing them to take root and propagate new plants. Hence, aptly named, the Yellow Walking Iris – propagating itself by ‘walking’ and producing yellow iris-like flowers! To us, Trimezia steyermarkii’s gorgeous flowers seem more orchid-like. Thus, we were instantaneously captivated by their beauty when we first chanced upon them at a nearby garden nursery last August. Upon learning that these are sun-loving plants, we grabbed three pots home and planted them at the outer border, a location that’d be just perfect for them. 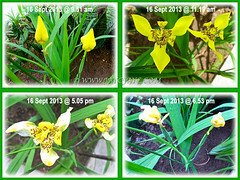 Common Name: Yellow Walking Iris, Traveling Iris. Etymology: The genus name Trimezia, in Greek terms: treis (three) and megas (great), refers to its flowers, where the three outer segments are bigger than the inner ones. The species epithet steyermarkii is named after Julian Steyermark (1909-1988) who was a prominent American botanist known mostly for work on New World flora, especially those in Missouri, Venezuela and Guatemala. Origin:Native to Chiapas and Oaxaca in Southern Mexico, and El Salvador, Guatemala, Nicaragua, Panama, Colombia and Venezuela in Southern America. Plant type:An ornamental herbaceous perennial. Features: Trimezia steyermarkii is an attractive species of the genus, Trimezia that consists of about 20 species of flowering plants. It is an evergreen perennial shrub that grows up to 1.2 m tall from underground rhizomes and gradually forms a large grassy-like clump by sending up offshoots. 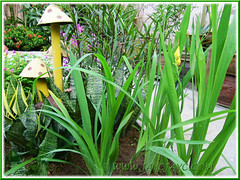 It produces bright green leaves that are sword-shaped and flat, 60-90 cm long by 2.5-3.4 cm wide and arranged fan-like. Leaves are smooth, thin-textured and have a rounded mid-rib. Iris-like flowers are bright yellow, each has 6 petals with three larger outer segments and three small inner ones, held atop a round inflorescence stalk that arises from the base of plant. They are prominently speckled with brown spots in the centre. Though it produces flowers that are short-lived, lasting less than a day and curling in the evening, the plant is free-flowering and continues over a long period. Because of the almost similar features, this commonly cultivated T. steyermarkii is often associated or mistaken for T. martinicensis and Neomarica longifolia. The latter has flat flowering stalks whilst Trimezia steyermarkii has rounded flower stalks and leaf axis. 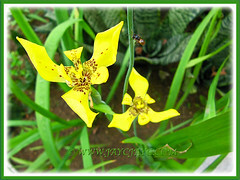 The closely related Trimezia martinicensis, on the other hand, has suberect inner tepals that fold inwards, smaller yellow flowers, as well as leaves that are narrower (about 1.3 cm wide) and shorter (up to 40 cm long) as compared with those of Trimezia steyermarkii. 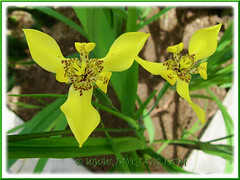 Seeds are rarely produced by the Yellow Walking Iris. Aerial plantlets will develop on the inflorescence stalk where spent flowers were and take root when these touch the ground, hence helping the plant to self-propagate by ‘walking’. Culture (Care): Trimezia steyermarkii is a hardy species that grows easily with minimum care. Moisture: Moderate watering, more at initial planting time and less once established. Can be drought-tolerant when established. Soil: Any kind of well drained and enriched soils. Avoid waterlogged soils that may encourage root rot by soil fungi/bacteria and kill the plant. Others: Feed once monthly with a balanced fertilizer. Dead-heading is unnecessary, but you can prune off the flowering stalks if you’d rather not have them develop aerial plantlets. 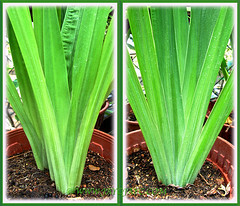 Staking may be necessary to prevent stalks from flopping and maintain a pleasing appearance. Cut off dried or withered leaves. For subtropical and temperate regions: Hardiness: USDA Zone 9a-11. Flowers from late spring to late fall. Some extra culture info at Gardening in the Coastal Southeast. Propagation:By division of clumps or rhizomes and by aerial plantlets. The plant produces plantlets at the inflorescence stalk where the spent flowers were. 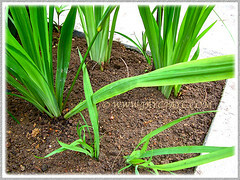 Just snip them and plant in the ground or pots. Alternatively, you can just allow the arching stalks weighed down by the plantlets, to touch the ground and these take root easily, self-propagating new plants for you. 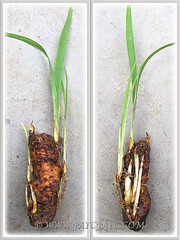 The image on the right shows newly planted Yellow Walking Iris, that were obtained by dividing a clump (those in the background) and from aerial plantlets that were growing on the flower stalks (in the foreground). 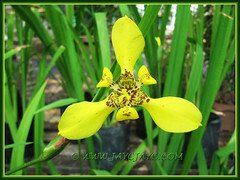 Usage: Trimezia steyermarkii or Yellow Walking Iris is ideal for mass planting in flower-bed or garden border. Suitable as an ornamental shrub for landscaping in parks and gardens, or as informal hedge in home garden. Attractive plants for container gardening or raised beds/planters.